London is known for its street markets and there are several markets around the city that are open every day. Here you’ll find everything from London souvenirs to food and clothes. London is an expensive city and if you want to buy something to take home with you, the street markets are a good alternative since prices are often slightly lower than in stores. The most popular street markets in London are perhaps Camden Market, Portobello Market and Greenwich Market. On the Southbank below the Queen Elizabeth Hall is a large skate park where BMX riders and skateboarders gather every day to ride on ramps and do different tricks. In addition to this, there are also talented graffiti artists who paint awesome works to show off their skills. Even if you don’t go skateboarding or BMX-riding, this spectacle each day is still worth stopping by and checking out. At King Edward Street, you’ll find Postman's Park, which is located where the former headquarters of the General Post Office (GPO) were. The park is especially famous for its monuments of everyday heroes who died trying to save others. It was in 1900 that George Frederic Watts drew up a wall with memorials of deceased everyday heroes that he feared might otherwise be forgotten. A new memorial for Leigh Pitt was added in 2007, who died trying to save a child from drowning. It was the first time in 78 years that a new person was added to the George Frederic Watts memorial wall. If you do not have time to visit the Postman's Park during your London visit, there’s an app called "The Everyday Heroes of Postman’s Park", in which you can read about all the people present on the memorial wall. London is a multicultural centre and there are several neighborhoods that have elements of different cultures. One of these is the Little India area located at Southhall Broadway in Southhall. There are about 40,000 people here who have their roots mainly in India and Pakistan. During a visit to Little India, you’ll get the chance to take part in South Asian culture and tradition in a delightful atmosphere. There is also a large market where you can buy clothes and jewellery at low prices, or eat tasty dishes from the Indian and Pakistani cuisine. If you want to get a little feeling of Venice while visiting London, and at the same time want to get away from the hustle of the streets, then you might like to go to Maida Vale at Regents Canal, where Little Venice is located. The area at Regents Canal is very similar to Venice with its water channels and special architecture. Here you can also take a canal boat to explore the beautiful environment. There are also plenty of bars and restaurants where you can stop and relax. On King Charles Street in Westminster in St. James's Park, a short walk from Buckingham Palace, you’ll find the Churchill War Rooms. At this museum you’ll get to see what Winston Churchill’s War Rooms looked like during World War II and how the whole of the British government worked underground with their strategies and secrets as Germany’s attacks went on. The rooms that you get to see are original and the interior is completely preserved from World War II. Moreover, there are some rooms that are just part of an interactive Winston Churchill museum where you can follow all his work as a leader during World War II as well as his life story. Perhaps you’ve heard the stories of Jack the Ripper and Sweeney Todd, who were two of London's worst criminals of the 1800s. If you want to learn more about the history of the darker part of London's history, you can go on the London Dungeons, a small amusement park combined with stories from the past. These include two underground rides, a maze of creepy old London Streets, a torture chamber and the chance to visit the houses affected by the plague. In several places you’ll also meet different half-shady characters in order to make the experience even more vivid, played by an actor. After running around the streets of one of Europe's most densely populated cities, it might be nice to relax amongst some greenery. A very beautiful place that lends itself perfectly for a walk in the countryside is St. James's Park. The park is located right by Buckingham Palace in Westminster and the area is full of magnificent buildings with impressive architecture that can be seen from the park. There is also some wildlife among all the green. As you roam around in St. James's Park, you should therefore not be surprised if you encounter any impertinent and fearless squirrels or birds. Like most large cities in the world that attract a lot of tourists, London offers hop-on and hop-off buses. 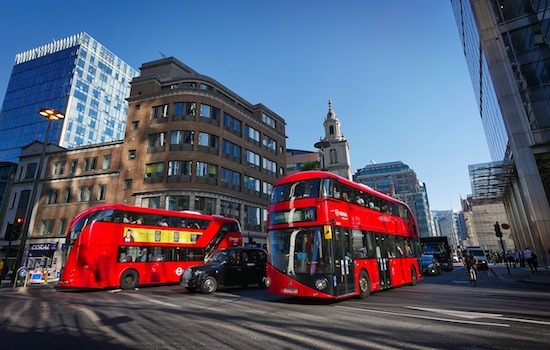 These buses take you to all sorts of attractions in London and in total there are three routes to choose from with lots of stops. The buses are spacious and comfortable for either the open air or roof, and offers a recorded commentary about the places you pass. For those who wish, there is also the opportunity to see all the sights from a boat on the river. This boat trip is usually included, along with walking tours of London and the price of the hop-on and hop-off bus ticket. If you're interested in airplanes or want to learn more about England's aviation history, you should visit The Royal Air Force Museum. In this museum you can learn everything about aviation history, from the first hot air balloon ride to the latest Eurofighter plane. Overall, there’s a collection of over a hundred different aircraft on display and there are several attractions—including a sound and light show that illustrates the Battle of Britain. The museum belongs to the sights of London that are ideal for families as there are plenty of activities for children of all ages. One London’s attractions that can easily be perceived as very "touristy" is the London Eye. This spinning ferris wheel is made for the typical tourist, but despite this, it’s difficult to call it a tourist trap as the London Eye offers a unique experience for those who choose to ride a lap or two. At the top of the wheel, you’ll find yourself over 135 meters above the ground and get a great view. One lap takes about thirty minutes and that’s plenty of time to look out across London in a way you won’t find anywhere else. In the evening you can also choose to ride on a so-called "Champagne Flight", which basically means that the capsule becomes one of London's best bars with a nocturnal view that you won’t get at any other nightspot. A very popular neighbourhood to visit in London for tourists and Londoners alike is Soho. This is largely thanks to the effervescent nightlife, and all the shops and restaurants as well as entertainment with music, comedy, theatre and cinema. Soho has an incredibly rich culture and there is a lot to do when visiting this neighbourhood. Soho is centrally located in the western part of London and borders Oxford Street, Regent Street, Leicester Square and Charing Cross Road. Previously, this was the royal residence but it’s now the site of Britain's parliament. The building has been destroyed and rebuilt several times and in 1834 it burned down completely. After the fire, the architect Charles Barry was hired and he created a gorgeous palace in a late Gothic style, which is attached to the medieval building Westminster Hall. The palace is very big at 275 metres long and ninety metres wide in total. It has three large towers, of which the highest is over a hundred metres high. Moreover, there are some smaller towers that are placed here and there with their characteristic pointed roofs. There are several beautiful rooms inside the Palace, including the octagonal Central Hall. Tennis has long been an important sport in the UK and this is reflected truly in the Wimbledon Lawn Tennis Museum. Here you can see how tennis has evolved from being something that the rich exercised during their parties to become a popular sport that has a turnover of a billion each year. Inside the museum, you can take advantage of great exhibitions, films, audio guides and interactive touch screens. There are also regular temporary exhibitions on different themes, such as "Tennis on the French Riviera." Besides rackets and other tennis equipment, there is also a collection of objects inspired by tennis, such as special toys and teapots. The Tate Modern is an art gallery that opened in 2000. It belongs to the Tate Group, which already has a gallery in London (Tate Britain) and two galleries outside the city of Liverpool and St. Ives. Many fine works of art in modern and contemporary art have been collected here from all around the world. Of all the hundreds of paintings there, you will find several works by Picasso, Matisse, Duchamp and Pollock. Every day there are four guided tours that are free of charge to participate in. These guided tours touch on different parts of the permanent exhibition and it is good to join in all of them to get an overview of what is on display. There are also several different activities and temporary exhibitions. They include tours for the blind where they can touch the objects and experience the art in ways other than by sight. Brick Lane Music Hall has performances every day with its popular form of musical entertainment. Usually you sit down and eat afternoon tea or a three course formal dinner while enjoying the nice shows. All year round the Brick Lane Music Hall has performances and they often have a theme that is related to the season. St. Patrick's Day and Seaside Special are two examples of themes, and others such as The Sixties Show, Diva and Cockney Sing Song. Often, the audience is very involved in the show and during a visit here you can be sure to get a good laugh and really feel thoroughly refreshed after the show is over. Both the food and the entertainment are of a high standard at Brick Lane Music Hall. The Royal Opera House is one of the leading opera houses in the world and an attraction that is well worth a visit. The building that The Royal Opera is in isn’t that old; it was built in the late 1800s and was recently renovated. The opera has however been around longer—it started in the early 1700s and over the years has entertained tourists and Londoners with its amazing opera performances. In total there are over two thousand seats for spectators and it is almost always packed during the performances. During the day you can book a tour, then take a bite of one of the Royal Opera's restaurants. Something that is very popular among visitors is to drink tea in the amphitheatre restaurant whilst enjoying a beautiful view of Covent Garden. Inside the Royal Opera House are The Royal Ballet and The Orchestra of the Royal Opera with fantastic performances all year round. The performances usually mix classic with modern dance and ballet. A slightly different museum located near Portobello Road's famous market is the Museum of Brands, Packaging and Advertising. It has a large collection of thousands of objects from the mid-1800s to the present. There are all sorts of different things, like Rimmel makeup from the 1890s, Chopper bikes from the 1970s or Oxo cubes from the period around World War I. If you’re an adult, you’ll very likely recognize several things that you remember from your childhood, or that you have read or heard about. The Museum of Brands, Packaging and Advertising is an interesting museum that will evoke many pleasant memories while sharing a knowledge about how various products have evolved and changed over the years. The Wallace Collection is one of England's foremost art collections on display in an old, beautiful and historical building from the 1800s. To begin with, the collection of art was privately owned by Sir. Richard Wallace, but was donated by his widow in 1897. The works in the collection really have been selected and curated with care and thoughtfulness. By the early 1900s, it was already considered one of the finest art collections in England and included several works by famous artists such as Rembrandt, Boucher, Rubens, Van Dyck and Peter Adolf Hall. The surroundings are also very pleasant to explore with beautiful rooms full of fine old furniture. It also features special performances throughout the year with different themes.